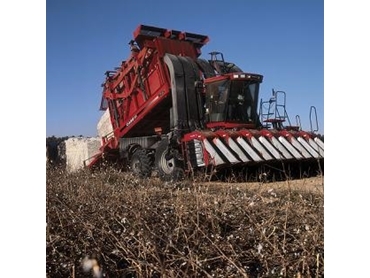 With recent rains giving the cotton industry a much-needed boost, Case IH anticipates more demand from cotton growers for technology that helps improve crop management. To maximise success, it’s essential for a cotton grower to know every inch of their paddocks, according to Case IH Hay and Harvest Brand Manager, Geoff Rendell. “Case IH’s Cotton Express cotton pickers and Module Express 625 provide on-the-go yield and moisture monitoring from inside the cab with the AFS Pro 600 monitor,” said Geoff. “This information can be viewed on your home computer using Case IH desktop software and can show you precisely where in the paddock you had variations in the yield and moisture content of your cotton. Once you know that, you can better appraise your paddocks and enlist the help of an agronomist if necessary to do soil testing or other investigations to ascertain what caused the variability. Geoff says efficiency will be the goal of most cotton growers in the season ahead.